Harry Jensen, member of Black Hills CFS/FMS Support Group, underwent surgery for chiari malformation in June 2001. Harry had been experiencing memory loss, severe pain in his hips, back, neck and knees. He also experienced headaches, vision change, fatigue, inability to sleep, restricted movement, nausea, weight loss, and a burning sensation to his feet and hands (sound familiar?). After he had been seen by several specialists and had undergone every test imaginable, he was diagnosed with Fibromyalgia (there appeared to be nothing else wrong). Harry entered a six-week pain management program to help alleviate the pain. It seemed to help, but one day while on the phone he collapsed, was non responsive, and at one point quit breathing. He was rushed to the hospital emergency room. After he came to, the severe pain hit. He was given pain medications, had another MRI (which was “normal”), was observed for a while, and then sent home. Harry’s wife, Kim (a nurse at Rapid City Regional Hospital), did not believe that these symptoms were a part of the Fibromyalgia diagnosis. What really concerned her was the passing out. This had resulted in a loss of independence for Harry because he could no longer drive. Kim took Harry to the Mayo Clinic in Rochester. A neurologist found that he had a chiari malformation. This is when the cerebellum (the back part of the brain) has what the doctors call tonsils protruding out of the back of the skull. This area would swell with the change in spinal fluid due to sneezing, coughing, and even during a bowel movement. These tonsils would then have nowhere to swell and would put pressure on the brainstem. 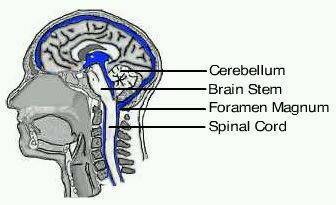 The brainstem is the overall connection between many functions, including breathing. Next, Harry was seen by a Mayo neurosurgeon. After discussing options and potential further problems if the tonsils were to continue to grow, he recommended surgery. He also recommended that the surgery be done in Rapid City and said that neurosurgeon Edward L. Seljeskog was familiar with the procedure. They followed Mayo’s advice and had the surgery done in Rapid City by Dr. Seljeskog. It was a very lengthy procedure. They opened the back of his neck down to his brain stem and removed bone from the skull to make the opening at the back of the head bigger to accommodate any swelling. In some cases they remove the cerebellar tonsils, but they felt that Harry’s were not long enough to require removal. Then they removed the membrane over the tonsils and brain stem and replaced it with a membrane that would give a little with the swelling of the tonsils. They also did a laminectomy, a surgical procedure that removes part of the vertebra to relieve pressure on the spinal cord or a nerve branching from the spinal cord, and fused some of the neck bones together. Today Harry does not have the pain in his knees, back, or hips. He does experience neck stiffness and discomfort at times, but states it is nothing like what he had before. He has increased neck discomfort with the cold weather, but the majority of his symptoms are gone. He can drive again, regaining the independence that he had lost. If you have any questions or comments, Kim or Harry can be reached at nurseinga@hotmail.com or you can call 605 754-6106. Kim will also be our guest speaker on February 16, 2002. Editor’s note: This article was written to bring you information on the controversial chiari malformation surgery. The medical profession is divided on the procedure. About half of the physicians believe that the chiari malformation produces Fibromyalgia-like symptoms and that the symptoms can be relieved through the surgery. Dr. Seljeskog wrote, “The relationship between chronic fatigue and Arnold Chiari Malformation is very tenuous based on my knowledge of the subject. There have been several studies that have disproven a relation-ship. Mr. Jensen’s symptoms were not those at all related to chronic fatigue or Fibromyalgia, but were entirely different.” From what I’ve read, the test of choice to diagnose the Chiari Malformation is the MRI (magnetic resonance imaging). The MRI will show if there is crowding of the space between the brain and spinal cord. The treatment of choice is surgery to decompress the area for persons with Chiari Malformation, symptoms associated with the malformation, and clinical findings on examination. When my co-worker, Harry, was diagnosed with Fibromyalgia, I thought to myself, “This is the worst case of Fibromyalgia I’ve ever seen. There’s got to be more going on here.” The main difference was his passing out and the extreme pain. After his successful surgery, I wanted others in our support group to hear Harry’s story. My thanks to Kim and Harry for sharing their story.